Yay!! The only thing I have knit like that is the dishcloths but I still know what you mean. It's all downhill from there. Yes! to down hill knitting. 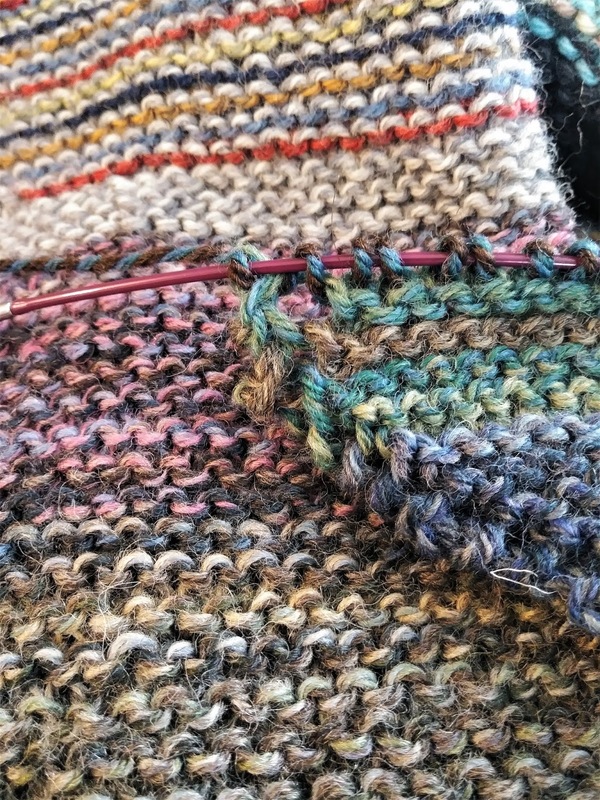 It's going to be to hot to knit on this blanket soon and I'm afraid if I put it aside, I'll never pick it back up again. Those last few stitches will be heaven! Yes, I love hitting major mile markers in my knitting. Amen to things feeling faster (and actually really being faster!!). This is going to be such a lovely blanket. Thanks! Don't know that I'd call it "lovely," because it's knit with spare skeins with no real advanced planning. But it will be soft and warm, and even better - machine washable! How long are the circular needles you are using? I'm using interchangeable needles with a 32 inch cord. As I decrease the stitches, I'll replace the cord with a shorter one. I like to have my stitches bunched up on the cord. Yay for progress!! And mentally having that perception of finishing is a good motivator.